They’re back! Funneling in from their breeding grounds in the Arctic areas of Alaska and western Canada, millions of birds have headed south along the Pacific Coast and the California Central Valley to escape the harsh winter. Up to 30,000 of these birds can be seen on a winter day at Upper Newport Bay Ecological Reserve and Nature Preserve, where they enjoy approximately 900 acres of prime real estate in wetlands and adjacent uplands. Our “Back Bay”, as it is known locally, is a diamond along this Pacific Flyway. With over 90% of California wetlands filled in and developed, this rest stop and feeding station is crucial to the survival of many birds. The Back Bay is the largest natural estuary left in southern California. Here fresh and salt water mix under the influence of the tides, making it rich in plant and animal life to nourish the weary birds. Already you can see the “flying clouds” of western sandpipers in the bay, as they twist and turn in unison by hundreds or thousands, undulating with the light playing off their white undersides. 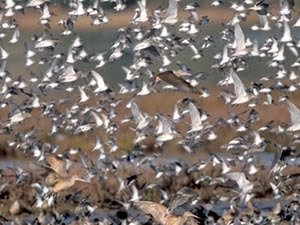 At low tide, thousands of shorebirds are seen frantically feeding in the mudflats, trying to recuperate up to 50% of their body weight which was lost during the migration. Long-billed birds like the marbled godwits and longbilled curlews are probing deeply, while the shorter-billed birds like plovers and sandpipers probe closer to the surface. At high tide, the shorebirds are then resting, while the many duck species can be seen feeding on the surface of the water in the cordgrass and pickleweed. About two hours after high tide, you can see many of these ducks start heading for the fresh water inlets or the fresh water pond in the Big Canyon area to bathe, rest and socialize. So, come on out and enjoy the respite from urban life. Bring your binoculars and look for the approximately 200 species of birds that visit the Back Bay. Maybe you’ll be fortunate enough to be near an osprey as it looks for prey from 100 feet in the air, then dives down and at the last minute thrusts its talons forward to grasp an unsuspecting fish. But don’t wait too long. In February and March many of these migrants heed the call to return to the Arctic and northern latitudes. There they will breed and be able to gorge on food almost 24 hours a day, fattening up themselves and their chicks for the next migration south.